Flinch is a collection of engaging stories by established and emerging creators, all playing on their interpretation of flinch. From facing the other within ourselves, to the tale of a prison inmate discovering what keeps him going to a handful of stories exploring traditional (and non-traditional) hauntings alike. 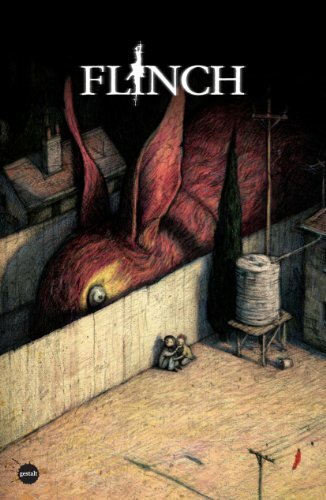 With cover art by World Fantasy Award winning Shaun Tan, Flinch features stories from creative collaborations including: UK fantasy author James Barclay & Chris Bolton, Ray Fawkes & Anton McKay, Justin Randall & Chris Bones, International Horror Guild Award winner Terry Dowling & Skye Ogden and many more! Flinch is a graphic novel anthology of dark stories, and the book is printed in black and white. I actually bought this thinking it's an art book — big mistake. The only story I liked was the first one about the prison inmate who was framed for murder. The storytelling is simple and while the ending isn't totally unexpected, it manages to close the whole story full circle. All the stories touch on something dark. There are stories on ghost catching, hunting for the giant squid, floating in space looking for new planets to inhabit, to name a few. Unfortunately, I have to say that the stories are disengaging rather than engaging. And page 111 even has a low pixelated quality print (shown in picture below). The artists and writers involved are James Barclay, Chris Bones, Terry Dowling, Michael Katchan, Bobby.N, Justin Randall, Andrew Richardson, Shaun Tan, Mel Tregonning, Colin Wilson, Chris Bolton, Tom Bonin, Ray Fawkes, Anton McKay, Skye Ogden, Christian Read, Christian Scott, Tom Taylor and Mark Welsh. Check out the official book website www.flinchbook.com for more information on the book. There are several page previews as well. I would have given this book a miss had I visited their book website prior to buying.